Different devices tune to channels in different ways, and Harmony must understand this in order to send Favorite Channels correctly. This option will send the exact channel number without any preceding zeros or a trailing Enter command. For example, sending Favorite Channel number 8 will only send the command 8. Although this may work for your device, we recommend selecting one of the below options so Harmony can tune to the channel more quickly. This option will send the channel numbers followed by a command such as Enter, Select or OK. For example, sending Favorite Channel number 8 will send the commands 8 then Enter. If this works from the original manufacturers remote, then we recommend selecting this option. This option may be used when your channel changing device supports a maximum of 99 channels and does not support the Number + Enter option above. For example, sending Favorite Channel number 8 will send commands 0 then 8. Sending Favorite Channel number 21 will send commands 2 then 1. 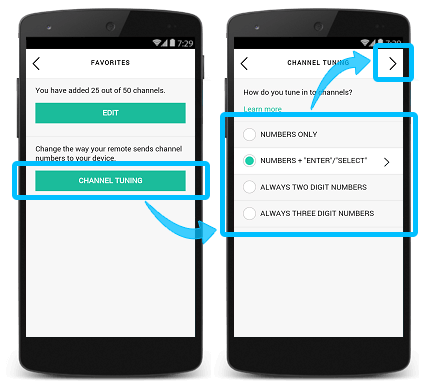 This option may be used when your channel changing device supports up to 999 channels and does not support the Number + Enter option above. For example, sending Favorite Channel number 8 will send commands 0, 0, 8. Select CHANNEL TUNING, followed by the method of channel entry. Once complete, press > to save your settings. Select the Favorites tab, along with Adjust How You Change Channels. 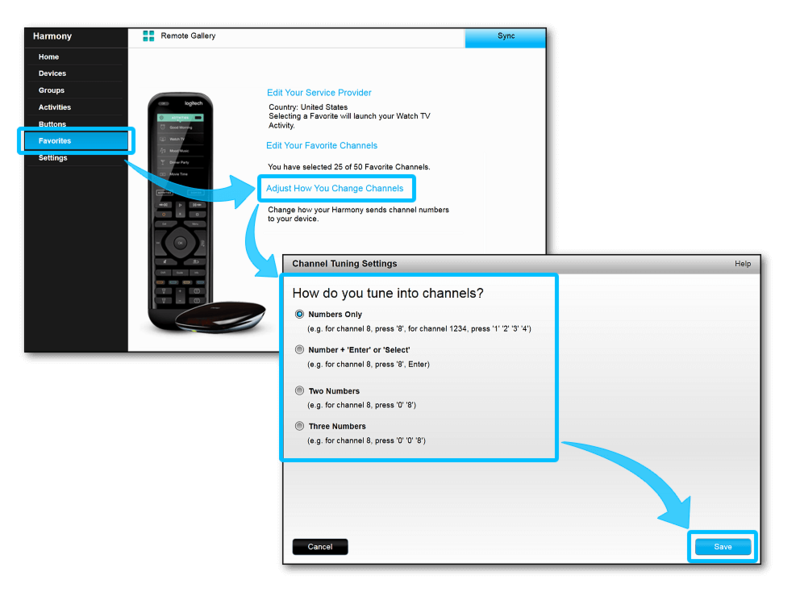 Select how your device changes channels, followed by Finish.